(Karlovy Vary element of the trip runs as normal. At Moser the workshops are closed, so we visit the museum and shop only). (Karlovy Vary element of the trip runs as normal, but there no visit to Moser as the factory is closed). A full day trip from Prague to the elegant spa town of Karlovy Vary, the foremost spa town in the Czech Republic. After picking you up from your Prague hotel, we drive for around two hours to reach Karlovy Vary, near the German border. Our first stop is the Moser Glassworks. The Czech Republic is well-known for producing beautiful crystal, and Moser boasts some of the finest glassware in the country. The guide leads us on a tour of the workshops at Moser, to show the various stages of the glassmaking process, and to observe the craftsmanship of the glasscutters and glassblowers. We also make a brief visit to the onsite shop. There is no pressure to buy, but the glass is considerably cheaper than in the shops in Prague and in your home country. Next, we continue on to Karlovy Vary where we make a stop for lunch and refreshments (lunch is not included in the price of the tour). There are a range of cafes and restaurants for you to choose from. We then embark on a guided walk though the centre of Karlovy Vary. The town was established in the Middle Ages following the discovery of hot mineral springs. It is a serene, beautiful place with gracious colonnades and picturesque boulevards. A deep forest surrounds the spa town. The invigorating waters are used to treat all kinds of health disorders and for general well-being. Past visitors include the Russian tsar Peter the Great and the poet Johann Wolfgang von Goethe. Both praised the healing effects of the mineral springs. 12 hot springs are currently in use. The best known spring is Vridlo, which belches its curative water to a height of 12m. Our walking tour of Karlovy Vary includes a taste of these waters. Finally, there is free time for a stroll through the streets lined with colonnades, and to visit the charming shops and elegant cafés. 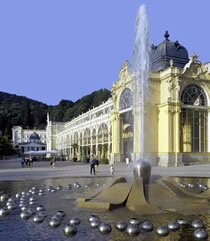 Hotel pick up + Guided tour to Karlovy Vary + Admission to Moser glass factory + Hotel drop off.